Elliots Beach- one of the cleanest beaches in the city of Chennai. 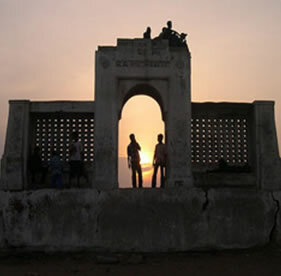 It is located towards the south of Marina Beach and is an extremely calm and serene place. The beach is known as Bessei amongst the locals. This beach is ideal for long walks. Moreover, the ones who want to soak their feet in the splashing sea water and lose themselves completely in the arms of the nature, head on. It is also the favorite destination of foreign tourists for enjoying sun bath. Elliots Beach offers very subtle activity, with only few food joints and restaurants. You can relish the mouth watering South Indian snacks and pamper your taste buds, here. Apart from this, there are some religious and historical monuments, to be explored, to add to your adventure. Ashtalakshmi Temple and Velanganni Church are some worth visiting places in the vicinity. The Ashtalakshmi Temple is around 20 years old and has modern style architecture. It is dedicated to Goddess Lakshmi and appears different from the rest of the Temples in South India. On the other hand, Velanganni Church is more of a pilgrim place for the Christians. The structure is smaller than the one at Velanganni. In addition, there is the Schmidt Memorial, which is dedicated to a Dutch sailor, who lost his life while saving a drowning fellow. It is one of the most notable landmarks on the famous beach.